Click this and you can get all this Black Girl Awesomeness sent straight to your email! The shoes. The dress. The fantasy. Bought into the idea that my sometime something love would turn into always something great. Didnt want to punish you for your fate. Your fruitless loveless last was in your oh so distant past. Gambled and rolled my dice around in your den. As line by line your tales tumbled from betwixt my lips. Hell, I dove headfirst into your arms without an exit strategy nor an end in sight. Because this would last forever. Two corpse hands clasped eternal. Two sovereign souls dancing in the wind. With you I wanted to grow into something old. Add you plus me and make something new. But you were my something borrowed. And my something borrowed made me something blue. Peeing standing up. I work at a community college in NYC and believe me the bathrooms can look like war zones. But there are those rare occasions when squatting wont cut it and I am forced to use the paper to pad the seats. But then I think about flesh eating bacteria and I wonder how this tissue paper is gonna protect my behind. FYI: Did you know that that paper can also be used to as an oil blotting sheet. Scouts honor! Of course you shouldnt put it on the toilet first but you get my drift… I hope. Writing one’s name in the snow. Call me crazy but this is something that I have always wanted to do. I havent tried it but I have thought about it… a lot. I have deduced that I would either need to drink 6 beers, shorten my name, run REALLY fast or grow a winky. Needless to say its not looking too good for the home team. Relieving one’s self outdoors. There havent been too many times when I needed this skill but there have been a few. And now that I am trying to live more of a “Carpe Diem” lifestyle I am going to make those opportunities more plentiful. And maybe its my dominant personality that desires to splash a tree with my liquid DNA but whatever the case may be, I want to do that. Dont judge me! *Luckily there is this contraption, the GoGirl! It allows women to pee standing up and on the go. Nifty, huh? Umm lets see what else? Ok maybe all of my reasons involve the potty or not having to push a human being out of a hole that starts out the size of nickel or not bleeding for days while craving crunchy salty sugary junk and getting emotional while listening to Man in the Mirror. Some of my reasons are sexual too but I prefer to keep my posts relatively PG in case I get hit by a bus and my family finds this blog. I think thats it for now. I can only have but so many intelligible thoughts with this gnome doing a jig in my ovaries in soccer cleats. Just got home from Dance Africa with my bestest friend. (No really we have been friends for 20 years in September and Im not even 25 yet) And because my lovely mother washed my phone in the washing machine the other day I have been phoneless or I would have taken photos to share with yall. Being phoneless in a society where we are addicted to the illusion of connectivity and communication shows you just how much of an illusion it really is. Because no matter how many followers I have or “friends” on Twitter this weekend I was alone. I only spoke to my mother, father, 1 of my brothers, my grandmother and three friends. Being phoneless shows you who really cares about your life and who just wants to know about your life. There is a difference. I have enjoyed the peace and quiet without that ever gnawing feeling that if I dont check my phone I may miss something. Life is happening all around me. I dont want to miss that. Im a sucker for dance photos. But yeah we went and there was a street bazaar around BAM with people selling all of the normal ethnic wares; jewelry, t-shirts, art, body lotions and oils and food. Oh the food!!! I ended up buying a conch shell ring, a wrap skirt, 3 pairs of earrings and a picture. 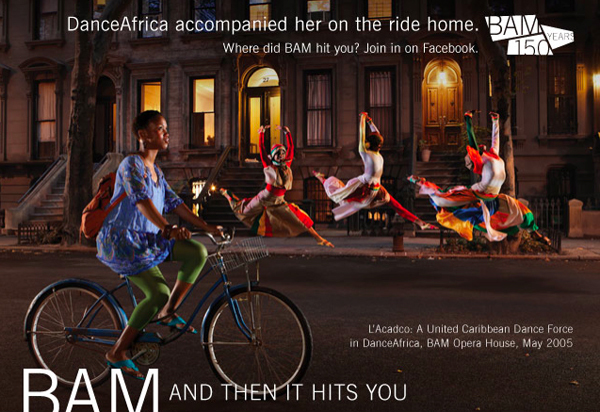 Then we went to the dance performance which was in BAM’s big beautiful theatre and it was absolutely amazing. I love to watch young people do African dance. Some of those girls were as young as 7 or 8 and all I could think about is in about 15 years that will be my son or daughter. My ancestors survived the Middle Passage, slavery, Reconstruction, Jim Crow, The 60’s AND Reagan but along the way our native identity was lost. But when the drumming starts there is something inside me that wakes up like recognizing an old friend. Hey, I know you! So its awesome to watch and be a part of. Furthermore (comma) they was gettin it!!! Do you hear me!!?!! I mean feet, legs, arms, hair, heads just movin. It took everything in me to stay in my seat! Powerful. But the thing that I love most about these types of events is seeing my people and feeling a great sense of community. No fighting, no strife… just good looking men and women out enjoying the weather and each other and life. Just enjoying life. I also enjoyed a beef patty and a small fruit salad. Did you think I was gonna pass all that good smelling food and not get nothing?!? Pssht!! You must not know me very well. But Im “grown” now cant be doing that right? Right!!?!? No really thats a serious question. 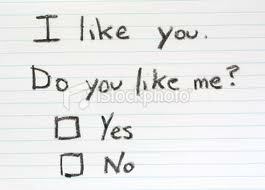 #PleaseRespond Seriously. He’s a really nice church-goin, God-lovin Brother. Dark skinned with a nice smile and dimples. 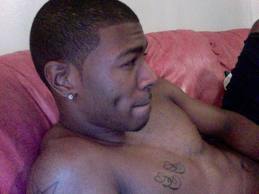 DIMPLES!!! No I do not know this man. If I did do you think I’d be blogging right now? Didnt think so! My object of crushingdom is just really nice and he’s my type and he’s been paying me just enough attention to make me wonder if he’s interested in me but not enough for me to feel comfortable being forward. For instance, he found me on Facebook. Thats 1. Then he asked me about my sorority (Zeta Phi Beta Sorority, IIIIINNNNNNCorporated :-)). Which means he was checking said Facebook page. That should count for about 3 points right? But because I over think things and have a VERY active imagination I could be making all this up and he’s just being nice to a fellow child of God. But mama noticed it too… and my mama dont lie. You see I have a history of making the first move as soon as someone pays me a little attention. Im impatient. I can admit that. But Im at a place in my life where I want a confident man that wants me enough to put himself out there. So I wait…. So I have been following this woman who goes by @bgg2wl on Twitter which stands for Black Girl’s Guide to Weight Loss. So I finally decided to check out her website of the same name and WOW!! Life. Changed! She introduced me to clean eating in a way that really made sense to me on so many levels. Especially the lil conspiracy theorist inside of me with her posts about the FDA & USDA and their lack of concern for the health of the general population. Her site is so comprehensive. I mean it literally has everything! Posts for information, inspiration, recipes, workouts and her own personal story. Oh yeah, she has lost over 100 lbs naturally. Just by eating clean and working out. So I have been cooking at home, taking my lunch to work, counting calories and Zumba-ing my tail off and I have lost 4lbs… and counting. So if you are also waging the battle of the bulge, check her out at blackgirlsguidetoweightloss.com. She made a believer out of me.